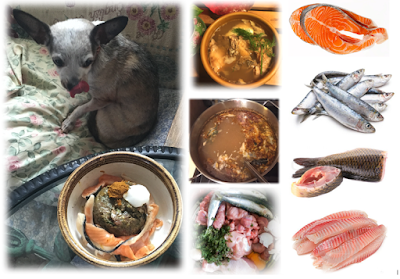 My dogs and cats enjoy raw fish, and fish broth as part of a healthy, raw whole fresh-food diet. If you currently use dry pet food, feeding raw may, or may not be something you are interested in BUT, you can improve your dog's and cat's daily diet by introducing gently cooked whole foods such as fish as treats, or meal toppers. 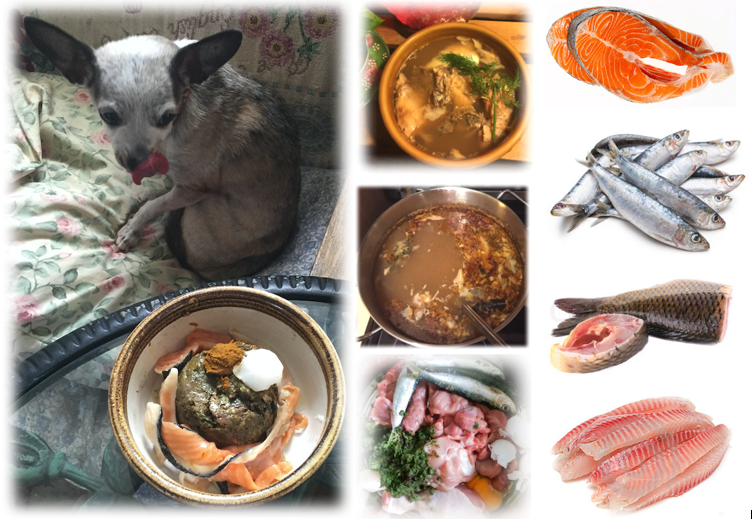 This article will help you understand how to select, and prepare fish; provide you with some recipe ideas to get started on a healthy-fish included diet; and help you introduce raw fish to your dog's and cat's diet. Deep, cold, open water – for example the Atlantic Ocean, the waters off of the Alaskan coast, and the Norwegian coast are less contaminated than other bodies of water. Fish that live in these cold deep waters offer high body-fat content, rich in EPA and DHA omega-3 fatty acids and the lowest levels of contaminants. If you want your dog or cat to consume fish for the amazing health benefits offered by high-levels of omega-3 fatty acids look for product that contain only wild or wild caught, cold water fish. Sardines are a favorite for my dogs and cats. It is important to select fish that is relatively low in mercury contamination. Cold water wild or wild-caught fatty fish, not currently endangered from over-fishing and lowest in mercury are: Sardines, Arctic char, crawfish, herring, Pacific flounder, Pacific sole, tilapia (low in Omega 3, high in omega 6), wild Alaskan Salmon, wild Pacific salmon. The highest mercury contamination for wild and wild caught fish occurs in: Atlantic halibut, golden snapper, king mackerel, marlin, pike, sea bass, shark, swordfish, and tuna (albacore). Fish from the high-mercury contaminated category should not be consumed more than one time per week. Pregnant and lactating dogs and cats, puppies and kittens should not be fed any high mercury contaminated fish. The wild and wild caught fish lowest in POPs is Wild Alaskan Salmon and California salmon. POPs are pollutants that exist in the environment which bioaccumulate in the body of humans and non-human animals. POPs are toxic substances that pose extreme health hazards to humans, animals, including dogs and cats, and the environment. PCB’s and DDT are two examples of POPs. You can read more about POPs here. Whole fish from clean, cold open waters offers the best quality, low-contaminant nutrition and are preferable to farm-raised whole fish or fish meal. Farm raised fish is one of the most toxic foods in the world. Canned fish is good to keep on hand for an emergency, but I don't recommend using canned fish as part of a long-term diet. Short term use of canned food (several weeks) has been shown to elevate levels of Bisphenol A (BPA) in dogs. BPA is a toxin and carcinogen - it leeches into canned food from the can lining material. Heavy metal and other contaminates can also leach into the food from the metal can and the can lining. Sadly, another problem with canned fish is mislabeling. In the last few years companies have been caught mislabeling fish - canned and packaged fish.The ocean conservation group Oceana, issued a report in 2013 exposing massive fraud in the sea food industry. You can read a brief overview of that report and download the full study here. You can also take a look at this article by the CBC. How often can you give your dog fish? Fish can be included in your dog’s daily diet, or you can choose to use fish several times a week, or just on occasion. But make sure you follow the tips provided above, to maximize nutritional benefits. A fish-based diet can be very good for dog’s, and cat’s suffering from food sensitivity (intolerance or allergies) to red meats and poultry. Some dogs, and cats have a food sensitivity to fish – i.e. experiences diarrhea as his/her threshold for tolerance has been exceeded, you can choose to offer fish in smaller quantities or simply remove fish from the daily diet. A dog, or cat may have an adverse reaction to one type of fish – for example, salmon; but do well with a less oily fish such as sole. Fish should never be used as an exclusive diet on its own – meaning you are not feeding your dog or cat any food item but fish. A diet that consists of fish, and no other food can result in thiamine deficiency leading to loss of appetite, seizure, and in severe cases death. Never feed your dog or cat raw fish that has not first been frozen for at least 7 days. Freezing for a minimum of 7 days ensures that any parasite that may be present in the fish, is killed. To avoid formation of bad bacteria, always defrost raw frozen fish in the refrigerator – don’t allow raw fish to defrost on the counter, etc. As soon as the fish is defrosted its ready to be eaten by your dog, and cat. Once defrosted, use within two (preferred), up to three days. Small-size whole raw fish such as sardines are perfect for smaller dogs and cats to consume whole (including the sardine head and tail). Sardines come in several sizes – from several inches long up to 5” to 6” long. Sardines are a great choice to begin transitioning your dog or cat to raw food. Start by giving your dog or cat a small sardine, (or piece of), as a treat away from other food, and meals. Don’t mix raw food including raw fish with a highly processed dry (kibble) or wet ‘food’ product meal. If your dog or cat has never eaten raw meat, and you are not ready to transition to raw you can gently (at lowest setting on stove-top) cook the fish in a little healthy fat such as organic: coconut oil, avocado oil, olive oil, or sesame oil. Fish can be used as the primary animal protein or as a secondary animal protein in your dogs and cats food - prey model raw (PMR), bones and raw food diet (BARF), raw grind complete meal, or cooked homemade food. You can find an example recipe for homemade raw and cooked dog and cat food here.. Fish heads, fish tails and whole fish are excellent for making health sustaining broth, and bone broth gelatin. As you can see, if you choose wisely there are many ways fish can support the health of your dog and cat. Whether your dog / cat is on a daily diet of kibble (highly processed dry ‘food’), or a raw food diet - adding whole fish or fish broth is a great way to add nutrition and diversify the diet!